As my IIGS serial port has failed I'm trying to get my Apple IIe Super serial card working to be able to copy some .dsk images to floppies for a mate. I've got my card setup as per the ADT-PRO site but when I do a IN#3 (card is in slot 3) I only get the ] prompt. If I press enter I get the ] again. Ctrl+A or Ctrl+I does not doing anything and I get a syntax error when typing 14B. Is my card dead? I've reseated all chips and cleaned the gold bus pins with alcohol. Here is a photo of the jumper settings. I've tried both Terminal and modem with the same jumpers. Ok the plot thickens. After moving the card from slot 3 to slot 2 and changing the jumper from Modem to Terminal I get the SCC prompt. Speediboot does not work. It just gets stuck at the Load MLI: screen and does not advance. I've waited a long time. No flickering cursor. I've managed to send prodos then adtpro-serial client to get the client load. Then I format my disk and try and receive the adtpro disk image but it just stays at: Wanting for host reply. ESX cancels. I don't advance?? The .dsk image exists in the disks directory and my path is correctly configured in ADT-PRO. Any ideas? I have my CFFA3000 card installed does this conflict? Ok, but... did you set slot 2 to "your card" in the control panel? Ok, but... what kind of electrical connection do you have? Straight-through or null modem? ...I get the SCC prompt. Speediboot does not work. It just gets stuck at the Load MLI: screen and does not advance. I've waited a long time. No flickering cursor. If you don't get a response right away - like immediately - something (i.e. one of the above things) is wrong. I've managed to send prodos then adtpro-serial client to get the client load. With this current slot 2 setup, do you mean? Then I format my disk and try and receive the adtpro disk image but it just stays at: Wanting for host reply. ESX cancels. I don't advance?? The .dsk image exists in the disks directory and my path is correctly configured in ADT-PRO. Something is wrong with your cabling (or possibly your Super Serial card, or both). Only if you've set the virtual Disk II to use the same slot as your SSC. 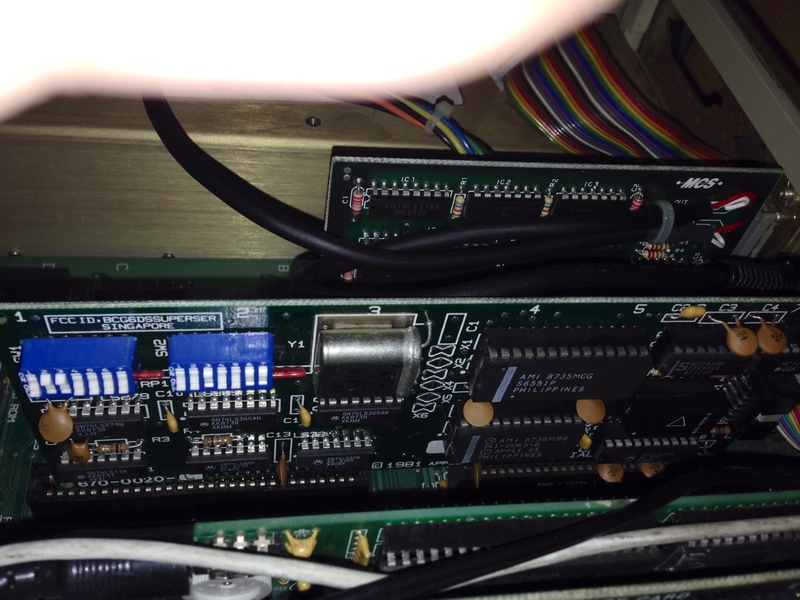 Can I use a US apple IIGS logic board on a UK Apple IIGS? Is there any power differences? I'm on my Apple IIe here. I'm using super serial II and a null modem cable. Cable is from a 56K US Robotics external modem. The strange thing is speediboot does not work but if I Bootstrap PRODOS and then send the ADT Serial client it loads???? It only fails when I have ADTP-PRO open on the Apple IIe and trying to send a .dsk image from my Mac to the Apple IIe. If the cable or serial port was wrong / damaged how can I send PRODOS and load ADT-PRO serial client? Apple IIe2 super serial card is configured as "terminal" and Im sure my cable is a serial cable. Unlike previous Apple II models, however, the layout and shape of keys were the same standard for all countries, and the ROMs inside the computer were also the same for all countries ... the built-in software-based Control Panel, which also provides a method of toggling between 50/60 Hz video screen refresh. The composite video output was NTSC only on all IIGS; users in PAL countries were expected to use an RGB monitor ... Outside North America, the Apple IIGS shipped with a different 220 V clip-in power supply, making this and the plastic keycaps the only physical difference. so yeah, I think the logic boards are the same across the board for all regions. Sweat. As on my Apple IIGs serial port has died, (not referring to this post above as the post above is to do with my Apple IIe) my sound fails the tests. I might try and source a new logic board. Looks like the IIGS uses commonly available 26LS30 and 26LS32 ICs for serial drivers and receivers. Might be any easy repair if you are handy with a soldering iron. Could be something else wrong, but most likely failure point of a broken serial port are the parts that connect to the outside world. I'm on my Apple IIe here. I'm using super serial II and a null modem cable. Cable is from a 56K US Robotics external modem. Hmmm, a null modem would be a strange thing indeed to use with a real modem. The strange thing is speediboot does not work but if I Bootstrap PRODOS and then send the ADT Serial client it loads???? That's not so strange. If the PC can send but not receive, and/or the Apple can receive but not send, and/or the cable has some kind of hinky handshaking, that's exactly what would happen. Pushing bootstrapping data blindly is a one-way street, leading to a false sense of security. Speediboot requires both sides sending and receiving. If Speediboot doesn't work, neither will the normal day-to-day two-way communications required for ADTPro proper. Correct, because again, this is a two-way street. And you have only shown that one way works for you so far. This all points to funkiness in the serial connection: could be your (USB?) adapter on the PC end, could be your cable, could be your SSC card. It's inconclusive given the symptoms described so far. To be honest I'm not sure what wiring the cable has as I mentioned it from an old US Robotics 56K modem. I think the cheapest way to start troubleshooting is to get my hands on a proper cable. That way I can slowly start troubleshooting. Cables then super serial card. To be honest I'm not sure what wiring the cable has as I mentioned it from an old US Robotics 56K modem. Quite. That's why I 1) give away the wiring pinouts and 2) sell pre-made cables - so we can all spend less time chasing these sorts of demons. I just can't understand the pinout for the iigs serial cable on your website... When I made such a cable it did not work for me. When I used a pinout listed on another website, it worked flawlessly. I can't understand that either. You may have misinterpreted the diagram - there's only so much one can do with ASCII art. It would be interesting to know how the two cables you built differ. What is there to misinterpret on the ascii diagram? Apple mini-din8 pin 5 to de-9 pin 3. Apple mini-din8 pin 8 connected to pin 4 on the Apple mini-din8 side. de-9 pin 7 to de-9 pin 4 on the de-9 side. Well, that's my question too. Your description is fine, assuming we agree on interpretations of pin numberings. So how does this differ from the cable you wired that actually works? Essentially, there are three differences, possibly four. For sure. I'm happy to folk put for the cable but the postage to Spain comes out at crazy $76 dollars for shipping. I think we spoke via email about this? Can't remember the reason why it was so high But it really makes it un-buyable for people in Europe I guess I'll have to hunt another way of getting my hands on a cable. International shipping is expensive because it needs to be trackable. Europeans get impatient with slow shipments, file complaints with PayPal, then get their money back or two of my cables. Either way, I lose. If you promise to be patient - we can talk. All having to do with handshaking. What USB adapter are you using? My cable works either with or without a usb adapter, and I have two different ones, with two different chipsets. I can use it either way and I know that it will work. And I have tried different combinations with different computers under OSX, Windows 2000 and XP. Sorry, but if I have found an answer that works for me, then I see no reason why I should investigate why your cable did not work for me. Thus, is the reason why I've already said that I can't understand why your cable did not work for me. So I will leave that speculation up to you. Suffice it to say that if I wasted 45 minutes of soldering, only to come up with a non-functional cable, then you can see why I'm not really willing to try it again. Besides, I have two uthernet cards. I don't even need to use serial, though using the super serial card II works fastest for me. I have an apple iie also and I have regular modem cables that work fine for me also. I have to admit that I did not use one of these cables to initiate the bootstrapping process. But this cable does work transferring disks. I completely understand, and don't expect anything else. Thank you very much for your understanding. As you already know, the cable I made using your pinout has been re-wired and sold. Your curiosity is perfectly understandable. If I still had the cable, I would definitely send it to you. I am not the only one who got curious because of something, but when I asked the people or when I tried to satisfy my need for info, I got nothing but disappointment. First you learn to get the answer and THEN you learn to check it!! !